By now you have likely heard the Office of the Secretary of the Department of Health and Human Services (HHS) has formally proposed delaying the transition date for ICD-10-CM to Oct. 1, 2014. 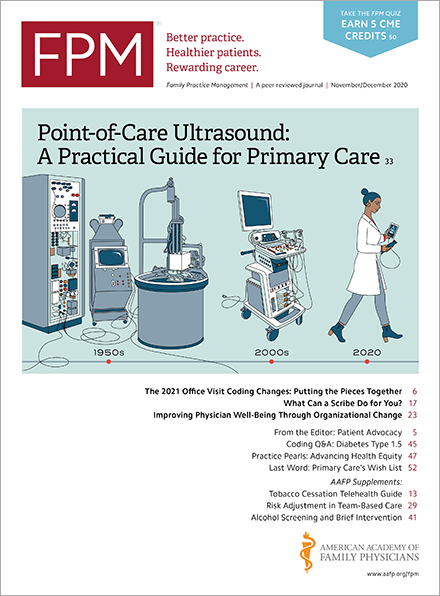 Good news for the practices that have not started or do not know when they will start preparing for ICD-10 (76 percent, according to today's reading of FPM's Reader Poll; vote and view the latest results in the left column of FPM's home page). You have an added year to get your plans in order and get caught up in preparing for this transition. But this is not the only portion of this proposed rule(www.federalregister.gov) that affects your practice. This rule also adds the implementation date for national unique health plan identifiers (HPID). By Oct. 1, 2014, all large health plans (i.e., payers) must apply for an HPID, just as physicians have applied for their national provider identifier (NPI). In addition, claims administrators, clearinghouses, and other entities involved in the claims process wil have the opportunity to adopt a national Other Entity Identifier (OEID). While this is good news in that it should eliminate some of the issues that occur with claims transmissions not routing to the correct claims administrators or payers, it will come with some costs to your practice. By Oct. 1, 2014, your billing system must be equipped to include these numbers on your claims. Small health plans have until Oct. 1, 2015, to comply, which complicates matters because you may need to send the HPID on most but not all claims. If your software vendor or clearinghouse didn't fare well in the transition to the HIPAA (Health Insurance Portability and Accountability Act) 5010 electronic transactions standards, now would be a good time to discuss with them when they will start planning and working to achieve compliance with the HPID. The timeline provided in the proposed rule indicates that your systems should be ready to send test transmissions of claims with the HPID by April 1, 2013. If you have comments on any of these proposals, the rule includes a comment period of 30 days from the date of publication in the Federal Register. Comments should include file code CMS-0040-P and may be submitted electronically on http://www.regulations.gov(www.regulations.gov) or in writing to Centers for Medicare & Medicaid Services, Department of Health and Human Services, Attention: CMS-0040-P, P.O. Box 8013, Baltimore, MD 21244-8013. While you'll have an extra year to get ready for ICD-10, there is another sizable task on the to-do list – to prepare your claims systems to submit the HPIDs. I guess it is true that what one hand giveth, the other taketh away.